As drying grasses lend warm colors to the natural landscape in late summer and fall, you might notice our biggest grass of all. It’s the tall – and unfortunately invasive – wetland plant known as phragmites or common reed. Phragmites (Phragmites australis) is hard to miss. It grows 6 to13 feet tall, with large plumes on top of its stalks. The plumes are purple during the summer but become tan later in the year. Its seeds are dispersed from November through March, but the plant spreads mainly by underground stems (rhizomes) that sprout roots and shoots. Phragmites forms dense stands that shade out and crowd out diverse native wetland plants and the animals that depend on them. This perennial plant also produces a chemical that suppresses the growth of other plants. Over time the dead stems and leaves of phragmites collect on the ground, form new soil, and hasten the drying of wetlands. You might spot phragmites in the wetlands along Rte. 9 (for example, between Rte. 135 and Otis Street), on the edges of swamps and other wetlands, and in ditches and retention ponds. It typically grows where water meets the shore. It thrives in places that are drier than the spots favored by cattails or by that other notorious wetland invader, purple loosestrife. You’ll find plenty of phragmites along the coast and on Cape Cod in salt marshes and brackish water, as well as inland in freshwater areas such as ours. The phragmites in our area – and probably all of the phragmites that you’ll see anywhere – is non-native (common reed, Phragmites australis). It came to North America from Europe. Here it spreads aggressively and is extremely difficult to get rid of. It readily gets a foothold in disturbed areas created by human development. Burning and cutting don’t control it because it just comes up again – often more vigorously – from its underground parts. Surprisingly, Massachusetts also has native phragmites (now known as American phragmites, Phragmites americanus), which is uncommon and declining. Fossil evidence indicates that phragmites existed in New England 4,000 years ago. 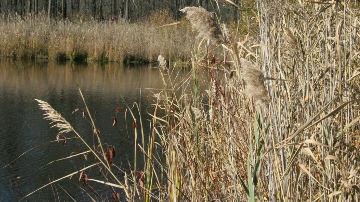 The native phragmites is not aggressive or invasive. These days it grows in a few locations on Cape Cod and western Massachusetts. Like other native wetland plants, it too can be outcompeted by the more aggressive non-native phragmites. How can you tell the two kinds apart? On the invasive, non-native phragmites, the middle and upper portions of the tall stems are tan, dull, and have ridges (during the growing season). On the native phragmites, these portions of the stem are reddish, shiny, and smooth (again, during the growing season). There are also genetic differences. Today phragmites is found around the world. In some places it has a long history of use. For example, in England it was grown and used for making thatched roofs. In Russia it provided cellulose for making paper. 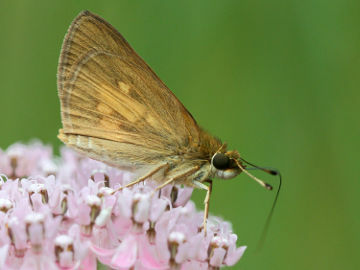 The broad-winged skipper is a small native butterfly that lives in and around stands of phragmites. In our area, phragmites can provide cover for birds and other animals, and a small native butterfly, the broad-winged skipper (Poanes viator), has actually benefited from the spread of non-native phragmites. This butterfly uses phragmites as its main host plant (“caterpillar food plant”). In other words, it lays its eggs on phragmites, and the caterpillars that hatch from those eggs feed on the phragmites and develop into butterflies. Its caterpillars do not munch enough phragmites to keep the invasive plant in check, however. The broad-winged skipper originally used native wild rice plants (Zizania aquatica), which also grow in wetlands, as its main host plant. This butterfly appears to have switched to phragmites and has spread along with the invasive plant. The broad-winged skipper has become more common in our area since the1980s. If you walk near a stand of phragmites July - September, watch for the small butterfly perching on foliage or taking nectar from nearby flowers. The broad-winged skipper is small, about 1-1/2 inches. When it perches with wings closed, you’ll see the tan undersides of its wings. It blends in well with the phragmites stems. If it lands with wings partly open, you’ll see the darker upper sides of its wings, with some orange markings. Small as it is, this butterfly is one of the larger ones in a group of butterflies called skippers (Hesperiidae). Many skippers use grasses as their host plants, so they’re typically found in meadows, fields, or wetlands, depending on where their particular host plants grow. Most skippers look a bit different from other, more familiar butterflies. Skippers have thicker bodies that seem somewhat moth-like, and their wings are shorter. The name “skipper” comes from the pattern of their flight, which is usually quick and darting, as if they skip from place to place. They take off quickly and don’t tend to glide. For a long time, skippers weren’t even considered butterflies, but now they are recognized as butterflies. As you see stands of phragmites persisting in our landscape through fall and winter, let them remind you of the complex relationships among plants, animals, and humans in the natural world around us.